What is the history of the plagiarism detection service Turnitin.com, and how have its marketing messages targeted the field of composition and rhetoric? How can we use SchoolSucks.com and Turnitin.com as vehicles for critical rhetorical analysis in the classroom? What benefits might there be for compositionists to adopt a pedagogy of resistance toward plagiarism detection services? Not only does Turnitin.com rely on a message of time-saving that showcases technology as a panacea for tension points in higher education like increasing course caps, lowered admissions windows, and lowered budgets, the site also relies on eco-friendly messages in conjunction with time-saving and ease-of-use to position the company as ethically responsible—use Turnitin and save the Earth. William S. Laufer (2003) details three aspects of greenwashing that companies may rely on to improve their image: confusion, fronting, and posturing. Jacob Vos (2009) describes the economic advantages of greenwashing, noting that companies gain a market advantage if they can align themselves with an ecologically conscious reputation (p. 258). Traditional greenwashing is usually practiced by a company that actually engages in ecologically unsafe activities while its advertising messages purport otherwise. iParadigms, LLC, does not technically engage in greenwashing because its products (OriginalityChecker, PeerMark, GradeMark, and so on) do no harm to the ecological landscape. But in looking at Laufer's (2003) adaptation of Beder's elements of greenwashing (see image to the left), it is apparent that iParadigms does participate in elements of confusion and posturing to turn attention away from the ethical issues regarding its use of authors' intellectual property and to instead focus on supporting an ethos that upholds ethical values. As detailed earlier in this webtext, Turnitin.com in particular has engaged in a continuous process of rebranding to avoid past associations with unethical use of students' intellectual property to build the database that checks for plagiarism. From 2006 to 2008 especially, Turnitin came under fire for its use of students' copyrighted materials in its database. Two students at McGill University in Canada separately challenged its use of Turnitin.com and both won after several years of struggle. In the United States, the first lawsuit against Turnitin.com was filed in 2007 by students at McLean high school in Virginia and Desert Vista high school in Arizona (Zimmerman, 2008, pp. 2-3). The attorney for the case argued that the archive of students’ materials clearly violated the U. S. Copyright Act and was not protected under Fair Use guidelines; furthermore, the fact that students were required to submit their work or receive a zero grade on that assignment placed external pressure and duress on the students to comply (Vanderhye, 2006, pp. 1-2). As an expert witness in the case, Rebecca Moore Howard (2008) spoke to the many ways that plagiarism detection services can disrupt proper writing pedagogy, compromise academic integrity, and cast students and their instructors as adversaries (n.p.). Ultimately, iParadigms, LLC and Turnitin.com won; in early 2008, U.S. District Judge Claude M. Hilton found that iParadigm’s use of the students’ written works constitutes fair use after considering the case against each of the four guidelines for fair use: the purpose or character of the use, including whether the use is for educational purposes; the nature of the copyrighted work; the amount and substantiality of the work used; and the “market effect” of the use of the work (pp. 12-19). However, Turnitin's reputation began to tarnish among some educators who questioned its ethical stance toward intellectual property, particularly when juxtaposed with marketing messages that heralded the site's upholding of traditional values and academic integrity. 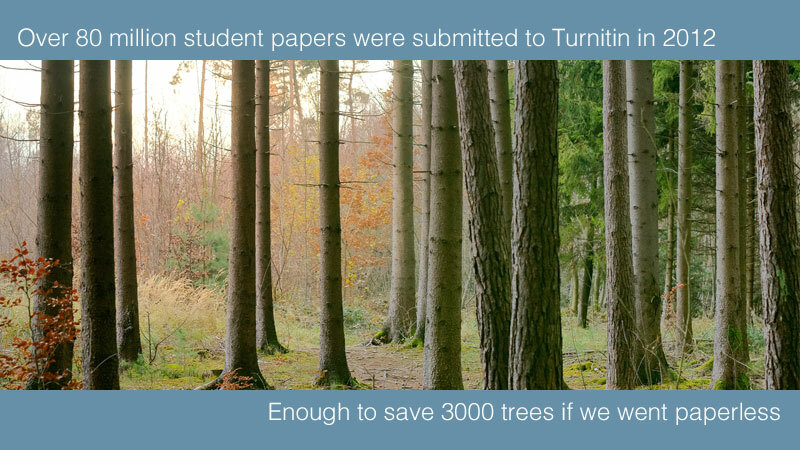 As a result, Turnitin has used image advertising to suggest a "green" and eco-friendly association and divert attention away from ethics and integrity and evoke a stronger ethos in customers' minds. For example, the blog associated with Turnitin touts the eco-friendliness of using GradeMark instead of collecting hard copies (note that it does not consider other alternatives such as collecting electronic copies via another technology such as email). Educators have a lot of writing assignments to deal with, and our Turnitin Teachers are no exception. 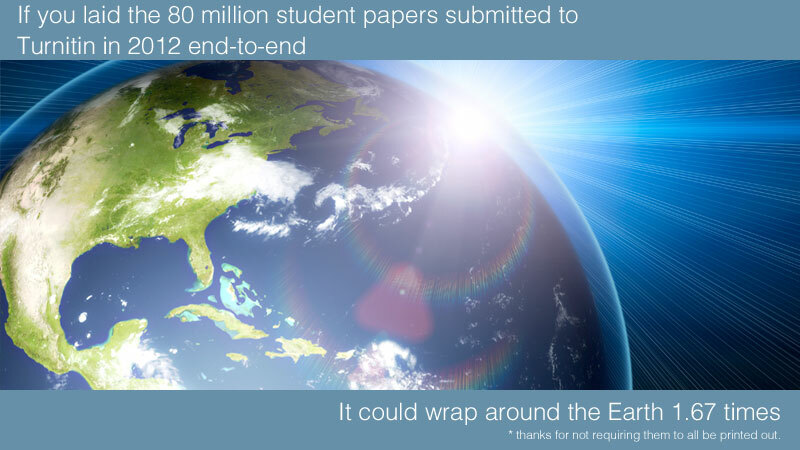 But thanks to electronic submissions and online grading, we’ve reduced the environmental impact of the 240,000 pounds of paper we would have used. So resolve to do more in 2013 by requiring fewer hard copies and mark up those papers with GradeMark—not only will you save paper, you'll also save time... and maybe your sanity as well. The two images to the left illustrate Turnitin's reliance on "green" metaphors of saving the Earth and saving trees to enhance the technology's reputation, even though other products do the same thing without being associated with iParadigms' products. Similarly, iParadigms, LLC has aligned its various products with individuals who can help enhance its credibility through what Laufer (2009) describes as posturing, promoting an image that assumes ethical leadership in the field. While Turnitin.com always used testimonials to showcase users' satisfaction with the products offered, Turnitin has in later years relied on the users themselves to train other users and recruit new faculty to the service. In 2012, for instance, Turnitin hosted a "Teachers Tour" of seven North American cities; presenters included Turnitin "Super Users," teachers who are considered experts at using the service. One such Super User even teaches online webinars through Turnitin Academy. In this way, Turnitin is able to publicly align itself with instructors sympathetic to its cause and enhance its credibility by relying on the ethos of the instructors it names Super Users. As iParadigms, LLC continues to refine and promote its marketing messages, it will be interesting to see what other aspects of confusion, fronting, and posturing are used to align the technologies with the values the site intends to highlight while downplaying ethical issues related to labor practices and intellectual property.